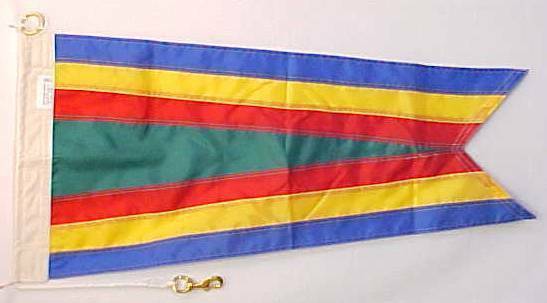 Also referred to as navy commissioning pennant. The act of placing a ship in commission marks her entry into active Navy service. At the moment when the commissioning pennant is broken at the masthead, a ship becomes a Navy command in her own right, and takes her place alongside the other active ships of the Fleet. This ceremony continues a tradition some three centuries old, observed by navies around the world, and by our own Navy since December 1775, when Alfred, the first ship of the Continental Navy, was commissioned at Philadelphia. Once in commission, the commanding officer and crew are entrusted with the privilege, and the responsibility, of maintaining their ship’s readiness in peace, and of conducting successful operations at sea in time of war. ""No written procedure for commissioning was laid down in our Navy’s early days, but the act of commissioning was familiar, derived from established British naval custom. Commissionings were simple military ceremonies. The prospective commanding officer came on board, called the crew to quarters, and formally read the orders appointing him to command. He then ordered the ensign and the commissioning pennant hoisted; at that moment the ship went into commission, and the first entry in the ship’s deck log recorded this. First logs from a sizable number of early Navy ships did not survive and, since commissionings were not surrounded by any public fanfare, they were not written up in the press. We thus cannot know exactly when many of the Navy’s first ships were first commissioned; all that can sometimes be known is when a particular ship first put to sea. Narrow pennants of this kind go back several thousand years. They appear in ancient Egyptian art, and were flown from ships' mastheads and yardarms from, at least, the Middle Ages; they appear in medieval manuscript illustrations and Renaissance paintings. Professional national navies began to take form late in the 17th Century. All ships at that time were sailing ships, and it was often difficult to tell a naval ship from a merchantman at any distance. Navies began to adopt long, narrow pennants, to be flown by their ships at the mainmast head to distinguish themselves from merchant ships. This became standard naval practice. Earlier American commissioning pennants bore 13 white stars in their blue hoist. 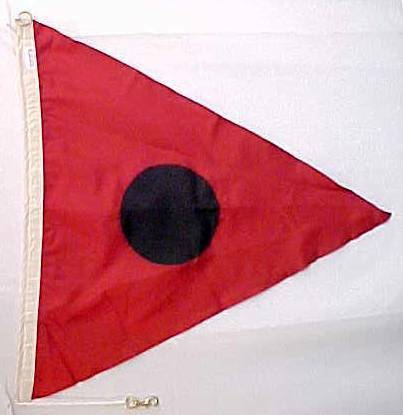 A smaller 7-star pennant was later introduced for use in the bows of captains' gigs, and was flown by the first small submarines and destroyers. This principle even carried over into the national ensign (national flag); bigger ships flew the conventional flag of their time, while small boats used a 13-star "boat flag" which was also flown by early submarines and destroyers since the standard Navy ensigns of that day were too big for them. The 13 stars in boat flags and in earlier pennants doubtless commemorated the original 13 states of the Union. The reason behind the use of 7 stars is less obvious, and was not recorded, though the number 7 has positive connotations in Jewish and Christian symbology. On the other hand, it may simply have been an aesthetic choice on the part of those who specified the smaller number. Until the early years of this century flags and pennants were quite large, as is seen in period pictures of naval ships. By 1870, for example, the largest Navy pennant had an 0.52-foot hoist (the maximum width) and a 70-foot length, called the fly; the biggest ensign at that time measured 19 by 36 feet. As warships took on distinctive forms and could no longer be easily mistaken for merchantmen, flags and pennants continued to be flown, but began to shrink to a fraction of their earlier size. This process was accelerated by the proliferation of electronic antennas through the 20th Century. The biggest commissioning pennant now has a 2.5-inch hoist and a 6-foot fly, while the largest shipboard ensign for daily service use is 5 feet by 9 feet 6 inches (larger "holiday ensigns" are flown on special occasions)""